Alone, with family or on an adventure with friends you can follow the footsteps of nomads while enjoying the atmosphere of our hotel. You’re sure to have an unforgettable stay in the heart the Moroccan desert. Riad Nomad welcomes you. A desert hotel located in the Sahara’s heart, on the beautiful oasis of Mharech. 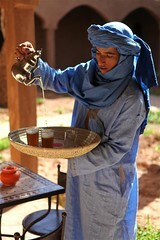 Riad Nomad invites you to this fantastic region to experience the local, real and untouched Morocco. Nestled atop rocks and dunes, Riad Nomad overlooks Morocco’s best-known natural icon, the Sahara Desert. 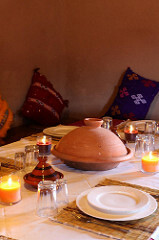 Riad Nomad has fully equipped rooms and a restaurant. It also offers several other activities such as camel trekking, bivouac camping, mountain hiking, and desert exploration. 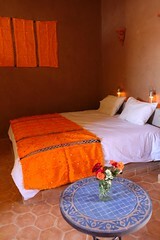 Riad Nomad combines both the grace and comfort typical of Moroccan culture. PHOTOS: 1- Front of hotel with panoramic view of the Sahara Desert and Foum Mharech; 2- Addi Ouyahia dressed in local traditional Sahara Desert Berber clothes; 3 and 4- Hotel with fully equipped rooms for the most comfortable accommodations possible; 5- Authentic Moroccan cuisine from the region; 6- Hotel staff serving the quintessentially Moroccan mint tea, in the Desert. 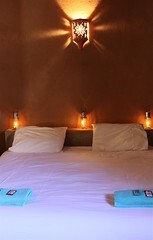 Riad Nomad is sure to be a fantastic experience of discovery, located in the heart of the Sahara Desert. Facing the majestic Foum Mharech Gorges, Riad Nomad holds spectacular desert views on the epic Paris-Dakar tracks. Delve into the foundation of Berber culture and explore this unforgettable land. View of Sahara Desert hotel by night. Traditional yet contemporary decor and inviting ambiance. Explore Morocco‘s unique and untouched regions. Get lost in learning and traveling the land of ancient culture and friendly people. Get to know the Sahara Desert like you would never expect. The hotel sits very near the tracks of the most well known stretch of the legendary Paris–Dakar Rally. These off-road routes connect the Sahara town of Zagora with Merzouga, a village in Erg Chebbi Dunes. 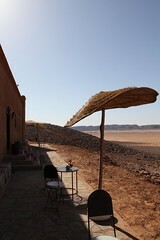 Riad Nomad is a hotel in Foum Mharech Gorges – southeast Sahara Desert in Morocco. Discover this unique desert hotel and welcome to our beautiful country!